Wrestle Mania 34 is in the books and probably the most shocking moment coming out of the show was a 10 year old boy winning the Raw Tag Team Championships with Braun Strowman. Yes, you read that correctly. 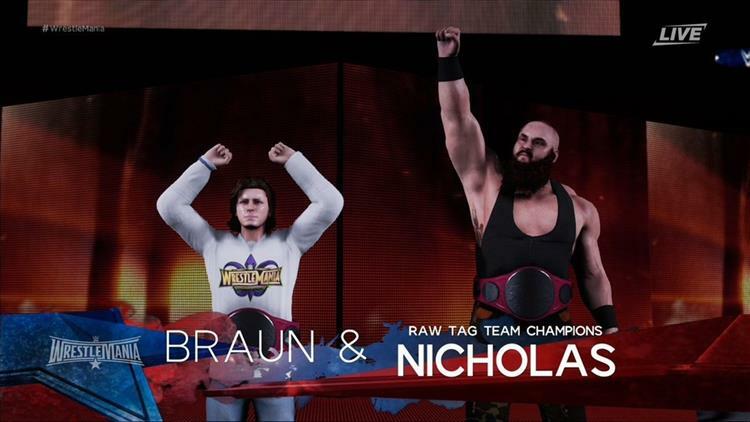 Unfortunately Braun and Nicholas had to relinquish the titles last night on Raw due to scheduling conflicts. You know, school. But there are no scheduling conflicts in WWE 2K18 as tons of Nicholas CAW's have already made their way to Community Creations. So if you want to have Braun Strowman and Nicholas plow through the Tag Team division in your WWE Universe, here you go.